Little did I know when I wrote my last post, … AND THEN CANCER MOVES UP ON MY LIST OF HEALTH CONCERNS (AND WHY I’M OK WITH IT), that it would be over 3 years before I would return back to the blogging scene. Life can be a tricky game to navigate. It turns out that my father’s diagnosis of stomach cancer would be just the tip of the iceberg in a series of life-evolving events. While still grieving and regularly travelling back home to our hometown to support our mother, my husband and I were busy designing our dream home during our evenings and weekends when we weren’t working. We are quite smitten with the final result and it is a true reflection of our personalities … much the same way as our wedding was a reflection of who we are as individuals and as a couple. In November 2013 we finally moved into our forever dream home. December 2013 I started transitioning from my current job into a new role in my department so the next few months were a real adjustment/learning curve. No big deal. February 2014 I had my six month colonoscopy / annual gastroscopy as part of my FAP battle, and it turned out that my condition was getting worse. Six months earlier I had only a couple of polyps and all of a sudden it had jumped to about 17 polyps in my colon with about another 30 that were too flat to be removed so they had to be left behind. 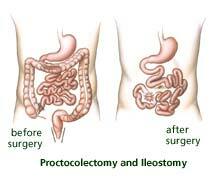 Such a drastic change in such a short amount of time made my GI Specialist nervous and she recommended a complete proctocolectomy with permanent ileostomy. March 2014 I decided to get away and cheer myself up. I travelled to Fredericton, New Brunswick to visit my dear friend Kelda who was undergoing a therapy program at the Stan Cassidy Centre for Rehabilitation. Kelda had been in a life-threatening and life-changing accident in June 2012 and I had been supporting her through her recovery since then. Most of my support was through funny letters that I would write her but it was nice to get away and visit her for a change. Kelda suffered Locked-In Syndrome as a result of the injuries that she sustained from her accident. You can learn more about her story through the Facebook Page that I created to keep her supporters up to date on her status — Kelda Farrell: Breaking Out of Locked In Syndrome. Although I had been supporting Kelda for the past nearly 2 years, I knew that Kelda would be a huge support and inspiration as I navigated through my upcoming surgery. April 2014 the most amazing thing happened! I became an Aunt!! Again, time that I could have been dedicating to blogging was consumed by visits to see the most adorable little human being. August 2014 I went back for my 6-month scope, and it appeared that my condition had regressed slightly. Perhaps it was due to taking curcumin, an anti-inflammatory supplement that has shown to slow or reduce polyp formation in some studies. We then entered the “do we even want to have kids” debate as I wasn’t sure if I wanted to pass along my genetic condition. During the Fall of 2014 in addition to doing research into what impact the various surgery options would have on fertility, carrying and delivering a baby, I was also busy doing some graphic designs so I could open a CafePress shop to raise a little money towards our fundraising efforts for the dog park. My 2015 New Years Resolution was to “Slow down enough to find time to read (and enjoy) at least one book over the course of the year”. I started out doing well with that goal (managed to knock off one book in the first 3 weeks of the year) but on January 29th, 2015 I found myself to be one of the first to fall victim of corporate layoffs when the price of oil plummeted. The next week I was due back to the endoscopy unit for my 6th month colonoscopy and gastroscopy (as if I wasn’t already stressed enough as it was). They asked “Any chance you’re pregnant?” My nonchalant response was: “Nope, I’ve been having cramping all week … I’m fairly certain my period will start during this procedure.” A few more days passed and still no period. “Geez, I don’t suppose I went through a colonoscopy while pregnant? !” I started to panic. Sure enough, 2 separate pregnancy tests confirmed it. I stressed what the drugs that were intravenously administered during the procedure would have done to my baby. Luckily, my family physician assured me that it was so early in the pregnancy that fluids were not yet transferring from me yet. Phew! So 1) surprise Layoff, 2) planned endoscopy, and 3) surprise pregnancy — January 2015, you were a pretty intense month! I had been planning on coming off my antidepressant for some time and my doctor had agreed to ease me off of it. But when I was laid off on short notice, I decided to ask her to keep me on it until things settled. The next week I returned. “Back again so soon?” was her comment at the sight of me, and my response was “Um. I think I’m pregnant.” She let out a little laugh (knowing that I would understand the ‘what else can the world throw at you after going through a layoff and a colonoscopy’ intent). I reciprocated with my own chuckle as if to say ‘I know, right? !’ Between morning sickness and cutting out my antidepressant cold turkey the First Trimester was a beast. I wouldn’t have physically been able to work. At this point the layoff was a blessing in disguise. I did start applying for a few jobs and even interviewed for one contract position as I transitioned into the Second Trimester and started feeling better. But returning to work wasn’t in the cards for me so I enjoyed the rest of my pregnancy without employment which allowed me to continue fundraising for the Dog Park and was luckily enough to officially open it during August 2015. Finally I had a little time to rest before our baby arrived 2 weeks early on September 28th. I’ve had my hands full from that day forward and it’s been an incredible 11 months so far!! Getting to GI Specialist appointments, prepping for and going through endoscopies, and meeting with surgeons, all with a newborn had its challenges but we were able to make it work. After a long debate we settled on the Ileorectal Anastomosis (IRA) option for surgery. Basically now I’m just waiting for a call from the surgeon and expect a weeks notice. It’s been one whirlwind of 3 years! So now that you’re up to speed on what I’ve been doing for the past 3 years, it’s not surprising that I haven’t had an opportunity to work on my blog. I started the blog as a means of doing some branding for the restaurant I was dreaming up in my head. Unfortunately, due to the loss of my engineering job, my dream of developing a restaurant for people with food allergies and dietary restrictions has been put on hold (and most likely indefinitely considering the decline of my health condition) as I’ll have no financial reserve to invest to see it through. It was a beautiful and vivid dream while it lasted. I expect that while going through surgery to have my colon removed, I’ll use this blog as a means to chronicle what I’m experiencing both physically and mentally… and no doubt there could be additional dietary restrictions imposed as a means of controlling the erratic behaviour of my new digestive system. Thanks for taking the time to read. Writing this post has been incredibly therapeutic.